all-natural skin-care line, LaLa Earth. and New England, in perfect harmony. At home, Lauren creates small-batches of her products in between rounds of tending to her chickens, lounging with her cats and working on projects related to self-sufficient homesteading. This meaningful space that Lauren has created helps to bridge both “work” and “life” environments, ultimately leading to a hand-crafted and small-batch earth-inspired product line-up. 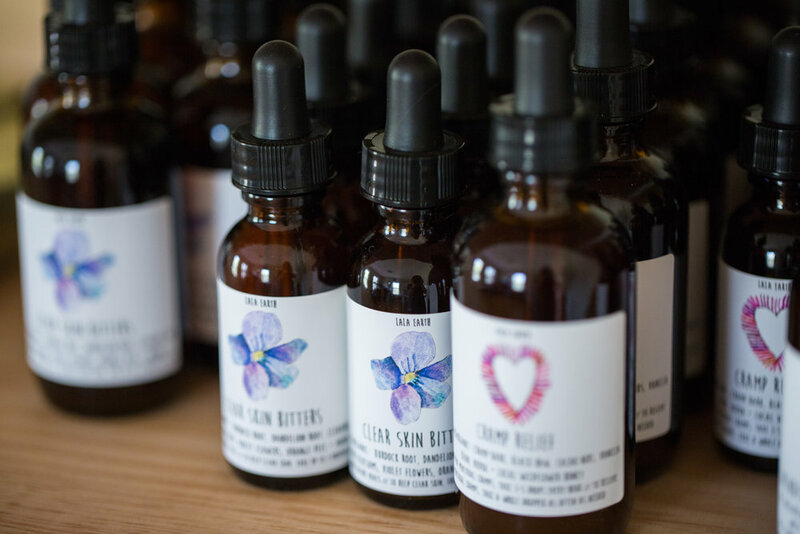 Her products range from healing hot chocolates to different types of salves and face toners to smudge sticks. While we chatted, Lauren created a batch of her Forest Salve and explained her interest in not only herbal remedies taken internally, but also her fondness towards topical remedies as well. Her Forest Evergreen Salve, for instance, is a topical treatment that captures the magical characteristics of New England’s winter woods through the evergreen. Rub directly on your skin and relive aches and pains, soothe overworked and tired muscles and heal dry skin. It’s a wonderful post-hike or workout treatment as it warms and relaxes the muscles — it also smells delicious! Lauren also enjoys experimenting with different ingredients, scents and flavors in order to craft truly unique products. Her Douglas Fir and Rosemary Facial Tonic – a perfect example of mixing two very different, yet complimentary plants, is a nourishing spray meant to hydrate the skin while enhancing mental focus (a characteristic of Rosemary) and grounding the mind and relieve stress (a quality of Douglas Fir). Truly committed to her surrounding community, Lauren strives to pull her ingredients from local farmers and shops, and work with fellow artisans whenever possible… a faithful steward of New England. While Lauren isn’t busy growing her own business, you can find her working with Milkweed Medicinals (www.milkweedmedicinals.co), a farm located in Hardwick, Vermont committed to selling organic seeds sustainably grown and harvested in Vermont and growing healthy and well-adapted plants for the Northeast region and selling organic seeds grown and harvested right in Vermont. Lauren is passionate about connecting consumers to the earth, which is evident through the values and mission of LaLa Earth. She loves inspiring others to use more holistic products and natural remedies for ailments and educating those on the different healing aspects of the plants that we are surrounded with right here in the region. To learn more about Lauren and LaLa Earth, visit www.lalaearth.com.